“The end result, we hope, is an app that looks and feels great across a family of devices,” Senior VP Vic Gundotra wrote of the Google+ changes. This is in line with Google’s mantra of late: Technology works best when it gets out of the way, and lets people do what makes them happiest: living, learning and loving. With the announcements of more interconnection of services, Google Maps as a virtual world, Google All Access music streaming and more, Owyang and Silva remind consumers to expect the tools and products to get better, but to know you’re the product. If brands want to play in Google’s sandbox, they’ll ultimately need to pay, they said in summary. Visit Web-Strategist.com to see the rest of Owyang and Silva’s commentary on what they called a “patchwork set of announcements from a fragmented company,” live from Google I/O. It’s no surprise much of this week’s news pertains to Google and their products, given their I/O event and a myriad of changes announced this week. However, Facebook also made headlines through their retail social/mobile partnership with Target, as did insightful reports for online marketers from Google and GlobalWebIndex. Google has rolled out a content recommendation engine, which makes content recommendations for users at the bottom of the screen on news sites with the service enabled. Sites need just one snippet of code to add this functionality to their site. See more at TechCrunch. Facebook continues to dominate as the most popular social network on the planet, with just over half the world’s online population logging in on the site in the first quarter of 2013. Google+ came in a distant second, with 26% of global internet users, followed by YouTube, Twitter and Sina Weibo. See further analysis of GlobalWebIndex’s report at eMarketer.com. Cartwheel, a new site from a Target/Facebook partnership, has launched in beta and will begin rolling out their mobile/social program for retailers to a select group of participants shortly. The program allows users to browse exclusive deals and sales, with additional savings for social sharing. 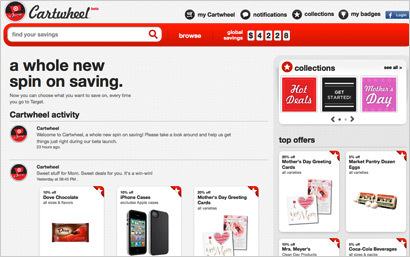 Learn more about Cartwheel at MediaPost. 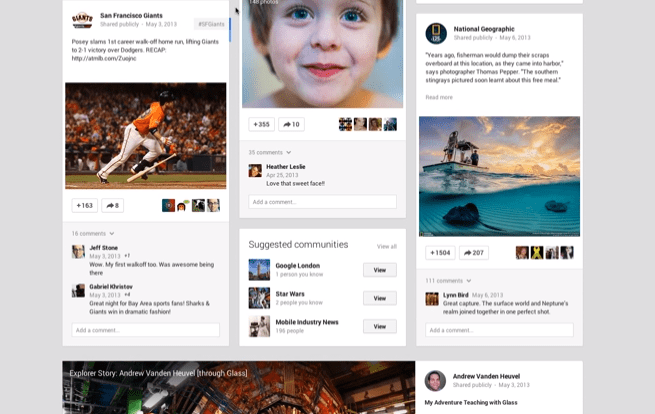 As part of the Google+ design makeover, a new feature enables automatic hashtagging in posts. Google will use data from their social graph and analysis to identify hashtagging opportunities and add them to content. Users can remove hashtags they feel are inappropriate. Read more about this new feature at Fast Company. The majority of consumers shopping in-store are using smartphones to help them make purchasing decisions, according to new research from Google. Of those, the vast majority – 82% – are using mobile search, rather than apps or direct navigation to company websites – to access shopping information. Search Engine Watch has additional insights from Google’s Mobile In-Store Research: How in-store shoppers are using mobile devices report. People in search of a visual way to see which videos are trending across the United States have a new tool, courtesy of YouTube. The YouTube Trends map displays the most popular videos across the country, with the option to drill down by gender, age, location and type of activity on the video. Our community – whether at Online Marketing Blog, on Twitter or elsewhere on the web – is a group of insightful, generous marketers always willing to share their experience with other members! ~ from Suffolk Graphic Designer in response to The Power of Visual Content Marketing and Brand Visuals in Action on how your audience learns through content. Stay tuned to the @TopRank Twitter channel this week for the latest online marketing, social and content headlines!